Zapier connects apps across the web, and helps Edgar import content for you from various sources. Edgar includes a great browser extension and bookmarklet that allows you to easily add content while visiting any web page. Your Edgar library includes special features that make it easy to add a lot of content in one quick action or make changes to multiple posts at once. A text only archive of the posts from your Facebook page can be downloaded and converted to a .csv file to upload to MeetEdgar. Go to your Facebook page and click on the Insights tab at the top. Then click on Export, choose .csv format, and download it. 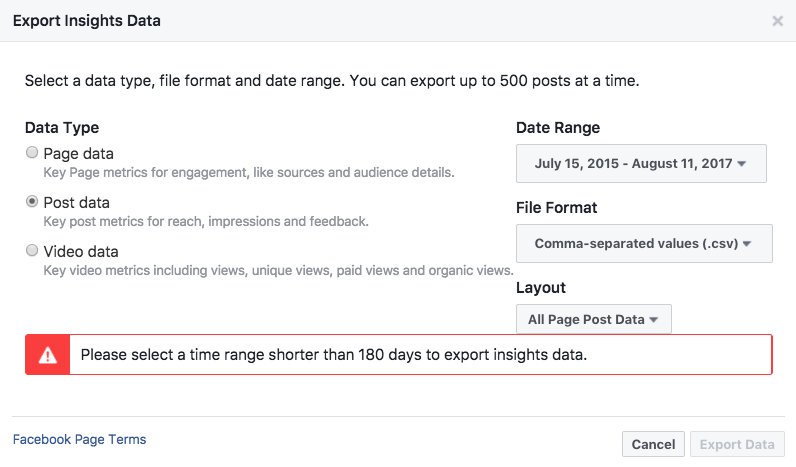 Using Numbers or Google Sheets, open the .csv file from Facebook and copy the column that contains your post content. Paste the content into column A of a new spreadsheet. In column B, you can put the category you'd like MeetEdgar to place each post in. Then save this spreadsheet as a .csv file and use Edgar's Bulk Import feature to import it. More information on Bulk Import is available here: Bulk Import. Edgar's Variations feature lets you quickly create multiple versions of the same post. Create as many as you'd like to make sure you have a deep and varied library for Edgar to post from. Learn more: Variations. A regular audit of your library can help your social posting stay fresh and relevant to your followers. When auditing your library, look for broken links to remove, add new variations to old or expired content, and delete any content that just isn't evergreen or relevant anymore. Here at Edgar, we review audit our library quarterly. Create a new category for holding content that you're just not quite ready to post or that needs to be reviewed by another member of your team.